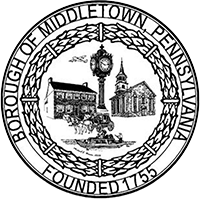 The Borough of Middletown is currently seeking a citizen of Middletown Borough to serve on Middletown Borough Council. Citizens interested in filling the vacancy must be a registered voter and a resident of Middletown Borough for at least one year. The individual selected will serve a term to expire December 31, 2019. By Borough Ordinance (§ 88-2), any citizen interested in filling the vacancy should transmit a RESUME, along with a letter of interest, to Grace Miller, Borough Secretary, 60 West Emaus Street, Middletown, PA 17057. Letters of interest and resumes may also be submitted by e-mail to jobs@middletownborough.com. Deadline for applications is Wednesday, March 28, 2018.